A recent website renovation serves as a case study on content management: Hampton Roads Virginia Vs. Tidewater Virginia. The upgrade involved expanding the sites geographic coverage from Hampton Roads Virginia to Tidewater Virginia. The upgrade also included enhancing performance for mobile devices and other changes. Redefining geographic boundaries for the project presented a number of challenges. The definitions of both Hampton Roads and Tidewater Virginia tend to be ambiguous and the terms are sometimes interchanged. After considerable research, boundaries were defined for the project: the areas of Virginia that are influenced by tidal flows. In general, the region includes coastal areas from the Potomac River to the North Carolina border and all of Virginia’s Eastern Shore. An important goal of the work was to achieve a simple and effective navigation plan with menus that worked with most traditional desktop web browsers as well as mobile devices. A local information section was required, leading to pages about attractions, lifestyle, cities and communities, colleges and universities, sports and recreation, FAQ, and others. A directory page provides an alternative arrangement of relevant information. Additional work included upgrading online store pages, including: apparel, books, stickers, and posters. One of the most important additions is the Tidewater Virginia waterways section. 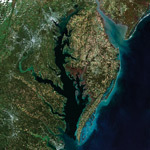 Included is information about the Chesapeake Bay and many of the area’s most important rivers and smaller bodies of water.